The tool is visible to instructors and students by default. If an instructor does not wish to use the tool, they may disable or remove the tool from the course. There are 4 optional questions which were developed based on suggestions from the Yale College Teaching and Advising (TLA) Committee. Instructors may opt to use any of those questions in their survey. Instructors are able to create four additional custom open ended questions for each course. 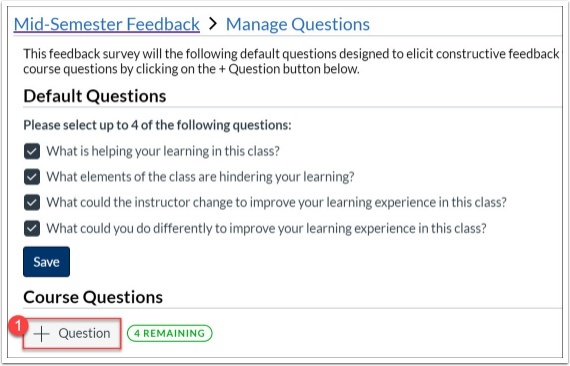 Only users with the role of “Instructor” in the course can add/modify questions and view student submissions. Only users with the role of “student” or “auditor” in the course can submit feedback. Student submissions will be purged on a pre-selected date that is displayed within the Mid-Semester Feedback Instructor tool. Instructors are welcome to download copies of the student feedback for their courses prior to the purge date. 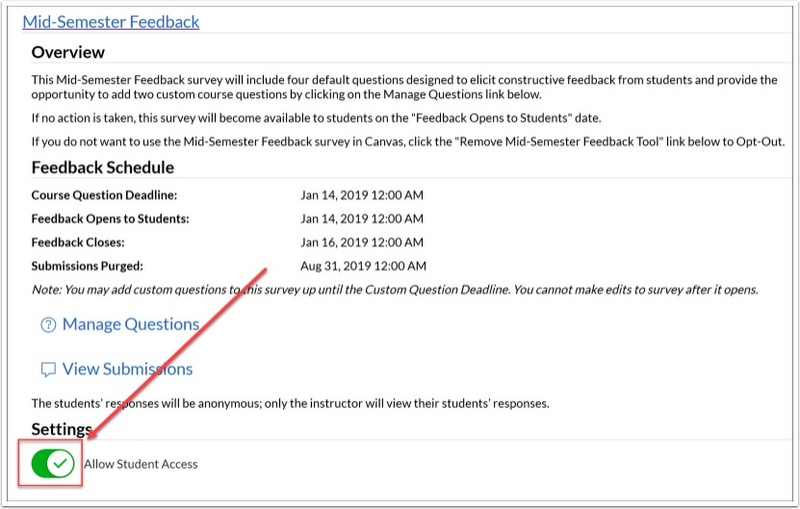 NOTE: The Mid-Semester Feedback tool is comprised of 2 separate tools located in the Canvas Course site’s course navigation bar - one for Instructors to set up questions and view survey submissions and a second tool where students will submit their feedback. Mid-Semester Feedback Instructor - This tool will be available to instructors at the beginning of the semester. All users in your course with the role of “Instructor” will be able to modify the survey and view submissions. TAs will see the tool in the Course Navigation, but will not be able to use the tools. Students will not see this tool. Mid-Semester Feedback - This tool will become available to students on the survey open date. The tool will be visible in the Course Navigation for all users, but only users with the role of “Student” and “Auditor” will be able to submit feedback. NOTE: This tool will become visible in your course navigation bar at the beginning of the semester - prior to the survey open date for students. Course Question Deadline - For each course, instructors are able to add/modify four additional open-ended questions. Instructors can make the additions/modifications up until the Course Question Deadline. 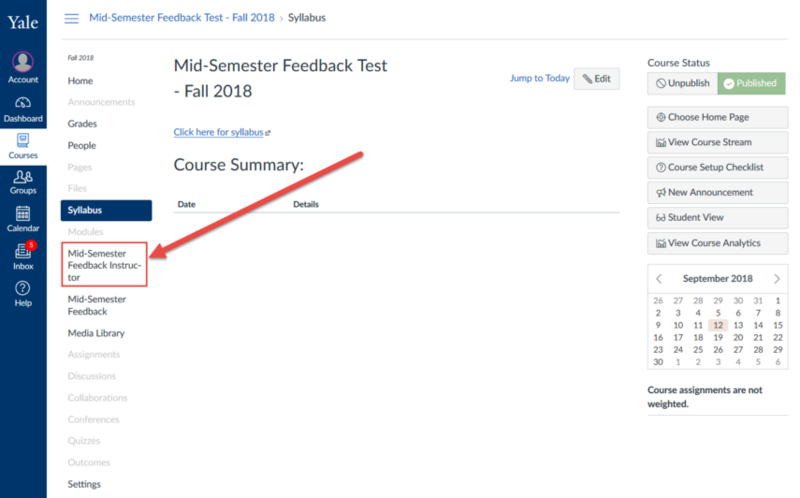 Feedback Opens to Student - The date upon which the student tool (Mid-Semester Feedback) will become visible and students will be able to submit feedback. Feedback Closes - The date after which no more student submissions will be accepted. The student tool (Mid-Semester Feedback) will automatically be removed from the course navigation menu on this date. The Feedback Survey will contain four optional questions which were developed by the TLA committee. The Instructor(s) of the each course site is able to add a maximum of 4 additional open ended questions to be included in the survey. 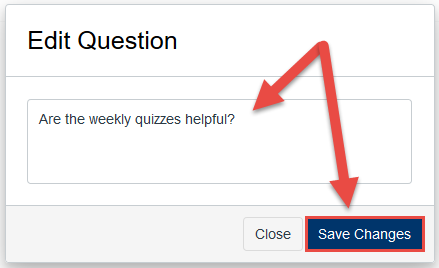 If you do not set up custom questions, students will still be presented with the 4 optional questions when the survey opens unless you deselect the optional questions. If you do not have any optional or custom questions in your survey, the tool will be disabled for students. 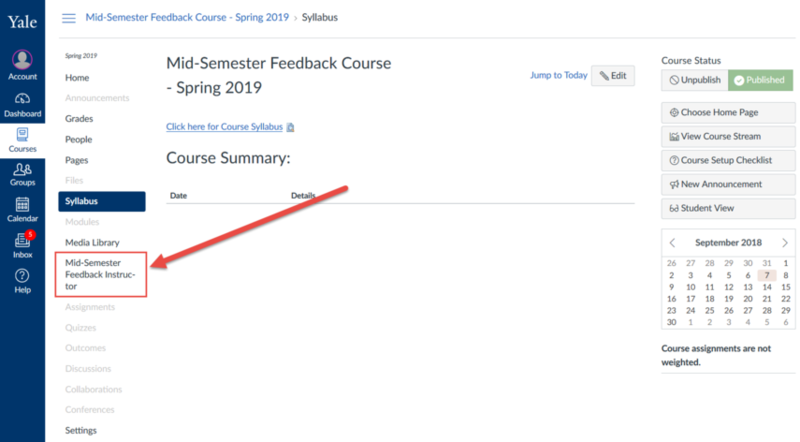 NOTE: If you are teaching multiple courses, you will need to set up the Mid-Semester Feedback Instructor tool in each of your courses. 1. Go to your Canvas course site. 3. To set up your custom questions, click the “Manage Questions” link. 4. On the Manage Questions screen, you will see a list of optional questions followed by a section where you can add your 4 custom questions. Click the “+ Question” button . 5. In the pop-up, enter the text of your question stimulus  and then click the “Submit” button . You may enter up to 2 custom questions. 6. 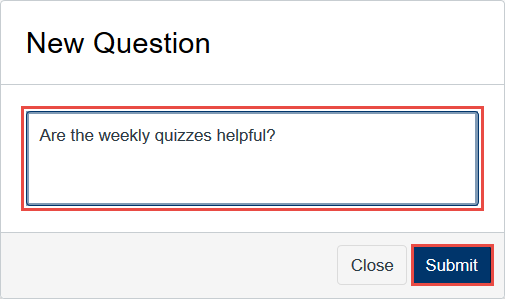 After you add a question, your question will be displayed on the Manage Questions screen below the required questions. 7. To modify your question, click the edit icon  next to your question. In the pop-up, modify your question text and then click the “Save Changes” button. 8. To delete your question, click the delete icon  next to your question. In the pop-up, click “OK” to confirm the delete. 3. To view student submissions, click the “View Submissions” link. B. Click the “Download All Submissions” link to download a CSV file containing all submissions. NOTE: Mid-Semester Feedback Submissions will be purged - be sure to check the Mid-Semester Feedback dates to see when the submissions will be purged for your course and make sure that you download a copy of your feedback submissions prior to that date if you would like to maintain a record of the feedback. After students begin submitting feedback, you will be able to view and download submissions. 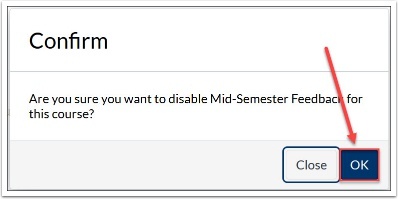 If you do not want to use Mid-Semester Feedback in your course, you can remove or disable the tool. You can always re-enable the tool. 2. Go to the “Mid-Semester Feedback Instructor” tool. 3. Once you are in the Mid-Semester Feedback Instructor tool, under the "Settings" section, click on the slider for “Allow Student Access”. 4. After you click the slider, you will see a pop-up asking you to confirm that you want to disable the tool in this course. If you are certain, click “OK”. 5. When you complete the process, you will see the message indicating that the tool is disabled. When the tool is disabled, the student tool will not appear in the Course Navigation menu. 2. Go to the "Settings" area . 3. Under "Settings", click on the "Navigation" tab . The upper portion - this part of the page lists out the tools that are on your course's navigation menu. The lower portion - this part of the page lists out tools that have been hidden from the student view. 5. 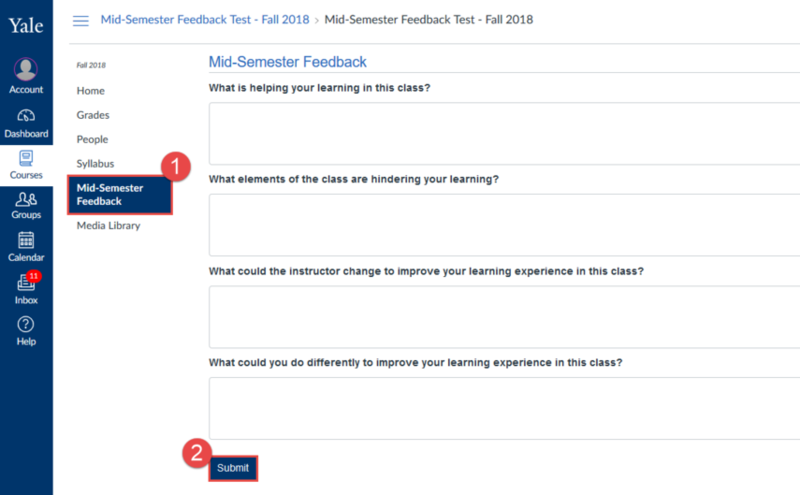 Drag the "Mid-Semester Feedback Instructor" tool  from the upper portion of the page down to the lower portion of the page. 6. Click the "Save" button  at the bottom of the page. 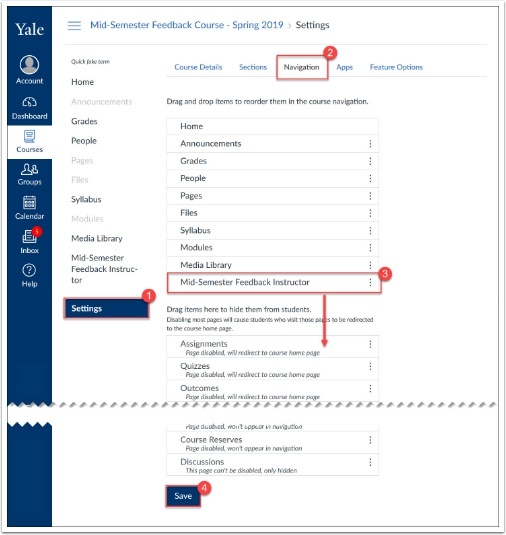 You can re-enable the Mid-Semester Feedback tool at any time. If you re-enable the tool after the Course Question Deadline, the survey will contain the default optional questions. 1. Go to your course site. 2. Go to the "Mid-Semester Feedback Instructor" tool. 3. Click on the slider for “Allow Student Access”. 4. After you click the slider, you will see a pop-up asking you to confirm that you want to enable the tool in this course. If you are certain, click “OK”. NOTE: This tool will become visible to you and your students in the course navigation bar on the day that the survey opens to students. Although you will see the student tool in the in your course navigation bar, only students will be able to submit feedback. 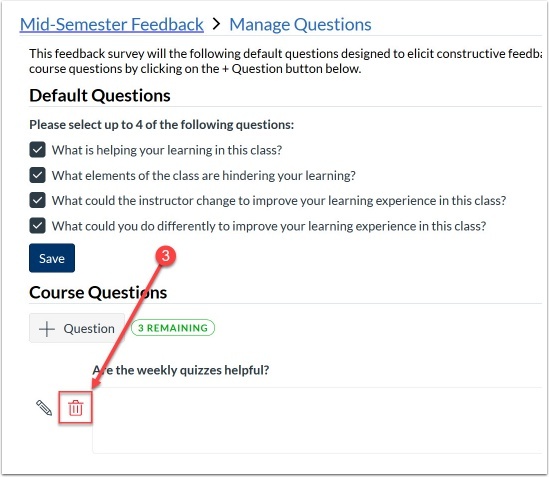 After the survey is closes, the Mid-Semester Feedback tool will be removed from the course navigation. Prev: How do I add and edit captions?